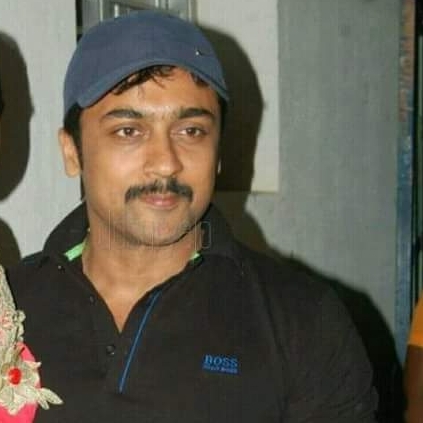 Suriya's latest pictures in which he is sporting his new look for the film Thaanaa Serndha Kootam (TSK) are now one of the most trending set of photos on the internet. There was a still that came out during the late hours of 28th November which has Suriya with a small boy. In the picture he was seen wearing a cap and sporting just a mustache. The very next morning, today (29th Nov), he was found attending the audio release function of the Ashok Selvan starrer, Kootathil Oruthan. He was found looking like how he used to, in the early 2000s. In the film 24, Suriya played a scientist who uses a time machine to travel back in time and he seems to have used it now to travel back to the early 2000s and get back his look from those days! This is the look that he majorly had in the late 1990s and early 2000s, like in the films Friends, Poovellam Kettupaar, Sillunu Oru Kadhal etc. TSK is directed by Vignesh Shivn and it stars Suriya, Keerthi Suresh and RJ Balaji. This look of Suriya, has brought in a lot of expectations as to whether he will be playing a role which is on the lines of the ones he played back then? Will Suriya go back to the times when he did pure charming, romantic boy next door characters? Can we expect more looks from Suriya's TSK or is this the only look? Will the film be an out and out RomCom because Vignesh Shivn has showed his expertise in that with Naanum Rowdy Dhaan? Lets wait and see! People looking for online information on 24 the movie, Suriya Sivakumar, Thaanaa Serndha Koottam will find this news story useful.